FitnessRX for Women > Life & Health > Women's Health > Fit Over 40 > HIIT It Hard! Here’s the deal, I don’t care how old or young you are, it’s all in your head! I am proof of that! I am a huge advocate of HIIT for myself and my clients, as it provide serious results in less time than traditional approaches and a fun challenge that keeps people motivated. My partner and I have the best boot camp in Las Vegas equipped with sleds (prowler), tires, hammers, battle ropes, tension ropes, suspension straps, sand balls, kettlebells, etc. The average age range of our female clients is 34 – 58 years old. 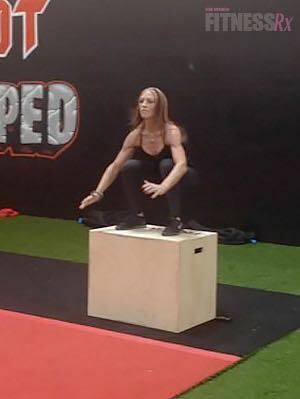 There is nothing more awesome than watching a 52 year old, RIPPED woman pushing a sled with a 45-pound plate across astro turf then performing a squat-thrust-throw with a sand ball. I love it. Numerous studies including ones led by exercise physiologist Martin Gibala, PhD, the chair of the department of kinesiology at McMaster University in Hamilton, Ontario, have found that HIIT workouts can provide the same cardiovascular and muscular benefits in one-half to one-third the time as those long durational endurance workouts, in just two short weeks. Another study from Ontario’s University of Guelph showed that a total of seven hours of HIIT over two weeks raised women’s fat-burning power more than 12 hours of medium-speed sessions. Repeat the following 2 – 5 times for a total of 15 – 30 minutes of work, depending on your comfort level and experience. * See below for a description of these exercises. 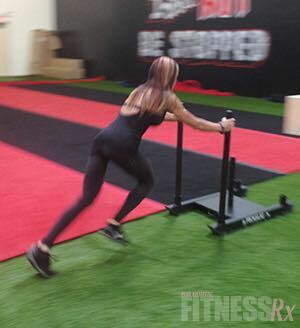 Sleds, commonly known as prowlers, are an incredible addition to any HIIT training program. It is truly an all over body workout from head to toe. Your arms are lengthened, your core kept tight and your quads, glutes and hammies are pushing (as well as screaming) all at the same time. Not to mention, with one push, you will accelerate your heart rate within 15 seconds. If you are at a gym that does not have a prowler or sled, a good alternative is a hardwood plyo box. Slide those babies across the floor for the same effect. The sled can either be done timed or by length and number of pushes. A good timed rep would be 60 seconds. A good length would be pushing the sled about 30 yards up and back twice. Battle Ropes are amazing for developing core, back and shoulder strength as well as sculpting, toning and burning fat. Most rope exercises are done with rope slams (two hands at once) or alternating waves, but sidewinders are also brutal. To perform a sidewinder, grab a rope end in each hand, keeping a bit of slack on the rope. Assume an athletic stance and then move the rope side-to-side across your body as fast and explosively as you possibly can. These are typically timed. You have got to believe that you can do this at ANY age. Obviously, depending on your fitness level, you may need to start off a bit more basic before you really HIIT IT HARD. However, you CAN work your way up to one of the most effective strength building, fat burning workout approaches, if you set your mind on doing so. Don’t forget to check with your physician if you have any injuries where modifications are necessary, but other than that, remember…AGE IS JUST A NUMBER.